Why is there so much fear surrounding LiPo batteries? I've been trying to design a charging system for a small robot powered by a 2S 20C lithium polymer (LiPo) battery. Were I to trust everything I read online, I would believe that the LiPo will kill me in my sleep and steal my life savings. The common advice I read, if you are brave enough to use LiPo batteries, is "never leave unattended", "never charge on top of a flammable or conductive surface", and "never charge at a rate faster than 1 C". I understand why this is prudent, but what is the actual risk with LiPo batteries? Nearly every cell phone, both Android and iPhone alike, contains a LiPo battery, which most people, including myself, charge while unattended—often-times while left on a flammable or conductive surface. Yet you never hear about someone bursting into flames because their cell phone exploded. Yes, I know there are freak accidents, but how dangerous are modern LiPo batteries? Why do so many online commenters treat stand-alone LiPo batteries like bombs waiting to go off, but don't even think twice about the LiPo sitting in their pocket? Every cell phone (as well as laptop and nearly everything with a rechargeable battery) uses LiIon/LiPo (essentially equivalent for the purposes of this discussion). And you're right: In terms of actual incidences, lithium ion and lithium polymer are the safest battery chemistry to be in wide use, bar none. And the only reason this now ubiquitous chemistry hasn't murdered you and/or your family several times over is because these cells aren't charged unattended. You may not be attending it personally, but every single one of those lithium ion batteries has a significant amount of protection and monitoring circuitry that is permanently integrated into the pack. It acts as the gatekeeper. It monitors every cell in a battery. It disconnects the output terminals and prevents them from being overcharged. It disconnects the output if they are discharged at too high a current. It disconnects the output if it is CHARGED at too high a current. If any of the cells is going bad, output is disconnected. If any cell gets too hot, it disconnects the output. If any one of the cells is overdischarged, it disconnects the output (and permanently - if you forget to charge a lithium ion battery for too long, you will find that it will no longer charge. It is effectively destroyed, and the protection circuit will not permit you to charge the cells). Indeed, every single phone battery, laptop battery, *whatever battery that is a rechargeable lithium chemistry is the most closely monitored, scrutinized, and actively managed, diametric opposite of 'unattended' as one can get for a battery. And the reason so much extra trouble is done is because lithium ion batteries are actually that dangerous. They need protection circuitry to be safe, and they are not even remotely safe without it. Other chemistries such is NiMH or NiCad can be used relatively safely as bare cells, without any monitoring. If they get too hot, they can vent (which has happened to me personally), and it can be pretty startling, but it isn't going to burn down your house or land you an extended stay in a burn unit. Lithium ion batteries will do both, and that's pretty much the only outcome. Ironically, lithium ion batteries have become the safest packaged battery by being the most dangerous battery chemistry. You might be wondering what actually makes them so dangerous. Other battery chemistries, such as lead acid or NiMH or NiCad, are not pressurized at room temperature, though heat does generate some internal pressure. They also have aqueous, non-flammable electrolytes. They store energy in the form of a relatively slow oxidation/reduction reaction, one whose rate of energy release is too low to, say, cause them to eject 6 foot jets of flame. Or any flame, really. Lithium ion batteries are fundamentally different. They store energy like a spring. That's not a metaphor. Well, like two springs. Lithium ions are forced between the atoms of a covalently-bonded anode material, pushing them apart and 'stretching' the bonds, storing energy. This process is called intercalation. Upon discharge, the lithium ions move out of the anode and into the cathode. This is very much electromechanical, and both the anode and cathode experience significant mechanical strain from this. In fact, both anode and cathode alternatively increase or decrease in physical volume depending on the battery's state of charge. This change in volume is uneven however, so a fully charged lithium ion battery is actually exerting nontrivial amounts of pressure on its container or other parts of itself. Lithium ion batteries are generally under a lot of internal pressure, unlike other chemistries. The other problem is their electrolyte is a volatile, extremely flammable solvent that will burn quite vigorously and easily. The complex chemistry of lithium ion cells is not even completely understood, and there are a few different chemistries with different levels of reactivity and inherent danger, but the ones with high energy density all can undergo thermal runaway. Basically, if they get too hot, lithium ions will begin reacting with oxygen stored as metal oxides in the cathode and release even more heat, which accelerates the reaction further. What inevitably results is a battery that self-ignites, sprays its highly flammable solvent electrolyte out of itself, and promptly ignites that as well, now that a fresh supply of oxygen is available. That's just bonus fire however, there is still a ton of fire from the lithium metal oxidizing with the ample store of oxygen inside. If they get too hot that happens. If they are overcharged, they become unstable and mechanical shock can make them go off like a grenade. If they are overdischarged, some of the metal in the cathode undergoes an irreversible chemical reaction and will form metallic shunts. These shunts will be invisible, until charging expands part of the battery enough that the separating membrane is punctured by one of these shunts, creating a dead short, which of course results in fire, etc. : The lithium ion failure mode we know and love. So, just to be clear, not only is overcharging dangerous, but so is overdischarging, and the battery will wait until you've pumped a ton of energy back into it before spectacularly failing on you, and without any warning or measurable signs. That covers consumer batteries. All this protection circuitry is less able to mitigate the danger of high drain applications, however. High drain generates no small amount of heat (which is bad) and more worrying, it causes huge amounts of mechanical stress on the anode and cathode. Fissures can form and widen, leading to instability if you're unlucky, or just a shorter useful life if it is not too severe. This is why you see LiPos rated in 'C', or how quickly they can be safely discharged. Please, take those ratings seriously and derate it, both for safety and because many manufacturers simply lie about the C rating of their batteries. Even with all that, sometimes an RC Lipo will just burst into flame for no reason. You absolutely need to heed the warnings to never charge them unattended, and everything else. You should buy a safety bag to charge them in, because it might prevent your house burning down (possibly with you or loved ones inside). Even if the risk is very low, the damage it can cause is vast, and the measures needed to mitigate most of that potential for damage are trivial. Don't ignore everything you're being told - it's all spot on. It comes from people who have learned to respect LiPos for what they are, and you should too. The thing you definitely want to avoid is having this lesson taught to you by a lithium ion battery, instead of peers online and offline. The latter might flame you on a forum, but the former will literally flame you. Let's see some videos of stuff exploding! Let me go a little more into how they fail. I've discussed the mechanism, but what really happens? Lithium ion batteries really only have one failure mode, which is kind of exploding then shooting out a stunningly huge amount of fire in a giant jet of flame for several seconds, and then continuing general burning-related activities for a bit after that. This is a chemical fire, so you cannot extinguish it (lithium ion batteries will still shoot out huge jets of fire even in the vacuum of space. The oxidizer is contained inside, it doesn't need air or oxygen to burn). Oh, and throwing water on lithium does nothing good, at least in terms of fire reduction. Here is a 'greatest hits' list of some good examples of failure. Note that this does sometimes happen in high drain RC cases even with proper safety measures in place. Comparing high drain applications to the much safer and lower currents of phones is not at all a valid one. Hundreds of amperes ≠ a few hundred milliamperes. Knife stabs smartphone sized battery. Laptop battery in thermal runaway is lightly pressed on, making it explode. To use Lipo batteries safely, you must treat them with the same respect you would anything that can store and rapidly release a large amount of chemical and/or electrical energy. The bigger the battery and the lower the internal resistance (e.g. higher C rating) the more you need to be careful. They can be used safely... just like gasoline can be used safely but to do so you must learn about how they operate and how they can fail. When you think about it, it's no surprise that, for instance, a Tesla battery has about the same level of risk as the gas tank it replaces... they both store a lot of energy that can be released rapidly when needed. Well actually, I lie somewhat because a Tesla battery only holds the energy of a tiny gas/petrol tank and it's got more safety checks built into it. All failure modes list above can result in "vent with smoke" or "vent with flames". Newer lipos with less volatile electrolytes can "vent with smoke" but you can never be sure; so you have to plan for the worse case. do NOT transport damaged cells; treat them with the same respect you'd treat a firework whose wick you aren't sure is out yet and that could still go off at any time! By the way, unlike what @metacolin wrote, it IS safe to discharge a Lipo to a low voltage and is the preferred thing to do before disposing of a pack. You want to remove all chemical energy from a pack to make it safe. What isn't safe is to discharge a cell below 2V and then to charge it. Charging a low voltage cell can cause Lithium to plate out making the cell unstable. So, yes, if you develop safe SOPs and take actions to mitigate risk you could use a Lipo in your robot. Until you fully understand safe SOPs, I wouldn't even consider making your own charger or BMS. Smart people have spent years stuff like that. Otherwise, depending on your design needs, maybe a simple NiMh, SLA battery could meet your needs. However, even NiMh and SLA batteries they have their own SOPs to follow. For instance, NiMh cells can blow up due to pressure during charging if they are overcharged and their pressure valve fails. SLA's generate hydrogen gas! during charging... so they need to be well vented. Remember everything useful can also be dangerous. Lipo's are no worse than a chef knife, or a airplane wing full of kerosene. The trick is to learn how to use them all wisely. @metacollin, writes that Lipo "anode and cathode experience significant mechanical strain"
False ... Lithium Polymer cells are not under any significant stress during normal operation. This is why they can be packed in plastic pouches. @metacollin, "They need protection circuitry to be safe, and they are not even remotely safe without it." Because cell mounted "protection" circuits can only be of limited size, they generally are only good for low current scenarios. If you desire fusing, you can place an appropriate fuse inline with pack. This is what R/C users do because they want batteries to be as light as possible and able to deliver high current. The ultimate strategy is to use bare cells wired into a more complete battery management system (BMS). BMS's can have many different topologies based on what parameters you are optimizing for. BMS's can also do other non-safety related things like adding features (e.g. a state of charge gauge) and trying to increase the lifespan of the battery by controlling operating parameters. Modern electric cars and electric bikes use BMS's (and not "protected" cells.) Additionally, modern consumer electronics with built-in LiPo's have switched away from using protected cells to using BMS's. E.g. iPhones, iPods, etc. From a safety aspect, all these setups do the same thing as a complete system. They just do it in different ways because they are optimized to different parameters. A. Have experts on staff and do extensive testing to make sure the charger will work safely across the full range of operating conditions. B. Buy pre-made ICs or assemblies that have been given that same level of care. C. Subcontract out the work to people who know what they're doing. When you build a charging circuit at home, you don't do any of those things. LiPo batteries can definitely burst into flame, as a YouTube search can tell you. You'll find people actively destroying the batteries with nails or even an axe, but you can also find more realistic examples, like this one of an RC aircraft violently bursting into flame due to a charging problem. Hence the warnings -- people on the internet can't guarantee that a homemade charging circuit will always work safely, and the failure mode of LiPo is "bomb". That's what a bomb is, after all -- lots of energy being released quickly. Context is essential when evaluating those dire safety warnings that you cite. They are not targeted at devices like laptops and cellphones (from reputable manufacturers) that employ tightly integrated battery management / protection circuitry to keep them safe. Rather, they target less safe devices, e.g. unprotected LiPo cells used in RC hobbies to power Remote-Controlled cars, planes, etc. Below we take a much deeper look at these differences in safety. Unlike other battery chemistries familiar to consumers, batteries based on Li-ion chemistry are inherently much more volatile. Due to such, they require very carefully designed battery management circuitry to protect them from catastrophic failure. This includes mechanisms that prevent them from reaching dangerous states (under or overcharge, over-temperature, over-current, etc) and, further, may disable them when dangerous conditions arise (e.g. via a FET, PTC or one-shot fuse). Such logic may even include sophisticated algorithms that continuously monitor the health of the cells in order predict impending serious failures (such as an internal short, which can lead to thermal runaway). Unlike most user-assembled hobby / DIY devices, for laptops and cellphones the manufacturer has design control of the entire battery power subsystem, therefore they can design a very tightly integrated system including sophisticated fault tolerant protection mechanisms. Such designs follow time-tested industry standards and employ multiple levels of redundancy and comprehensive failure analysis methods, e.g. fault-tree analysis or FMEA = failure modes and effects analysis. You may be surprised by the comprehensiveness of such analyses, e.g. below are 2 of 96 cases considered in IEEE 1625 2004, including the case that a pet urinates on the device (a PC). You may also be surprised by the high level of redundancy of fault protection employed, e.g. according to said industry standard, laptop batteries must implement at least two independent methods to turn off the charge FET to prevent catastrophic overcharging. Furthermore, if both methods fail, then a fail-safe chemical fuse must blow. This is a special voltage-triggered 3-terminal fuse that can function even under extreme conditions such as when the battery voltage drops extremely low due to a short-circuit. Contrast the above to your DIY project or RC hobbies where the end user is responsible for integrating the components of the battery subsystem and ensuring that they function together safely (the components being the cells, BMS/PCM protection board, device, and charger). There are many obstacles hindering such. The user may lack sufficient knowledge. The user may lack access to datasheets and technical information, which is generally not made available to consumers (cell manufacturers strongly discourage direct consumer use, e.g. 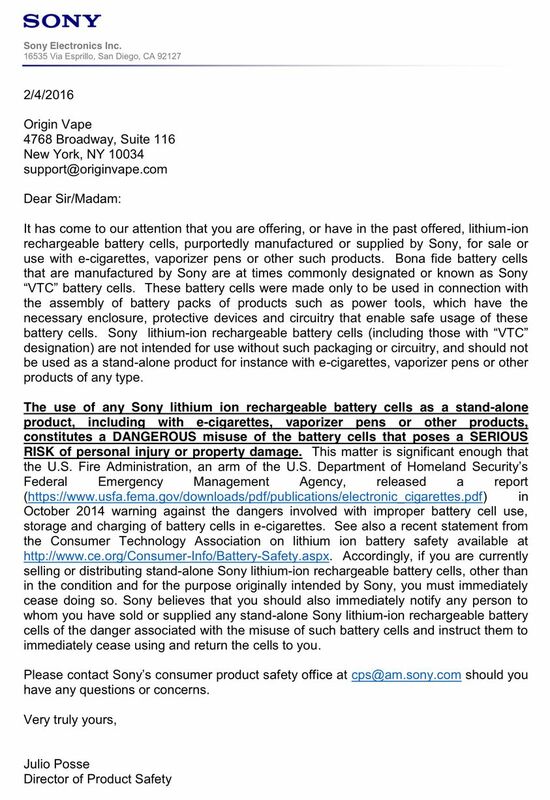 recently Sony sent a cease and desist order to a NYC vaping store selling Sony 18650 cells - see below). Lack of standard communication protocols such as SBS = Smart Battery System in the RC / hobby world limits the communication between subsystems, which greatly increases the difficulty of designing sophisticated safety mechanisms such as those in laptops. Here is a real-word example: a question from TI's battery gas gauge support forum. I am wondering if these Chemical Fuses are a mandatory element of Lithium-ion battery packs. I am working with a Chinese Li-ion pack supplier, and they produced a pack design based on a bq20z45-R1 fuel gauge IC, but there was no Chemical Fuse circuit. Also, there was no secondary-overvoltage-protection IC such as the bq29412. Are the Chemical Fuse and bq29412 (or similar IC) required for commercial Li-ion battery pack applications? Is there a Regulatory requirement? BTW, I am working on a medical device design. Above we have an example of a battery pack which lacks the 2nd and 3rd level of overcharge protection described above. Such omissions of safety features are common on many cheaper battery management systems. Not to mention some fly-by-night Chinese manufacturers who greatly exaggerate the level of protection implemented. In order to recognize such omissions and to comprehend their ramifications, when the end user is the engineer, they must have adequate background knowledge in the field. Lacking such could lead to designs with serious safety defects. That's why reputable cell manufacturers such as LG, Panasonic, Samsung, Sanyo and Sony refuse to deal directly with consumers. The risks are far too great if one does not have adequate knowledge to ensure safe design. Below is the Sony letter mentioned above. This is typical of the attitude of reputable cell manufacturers concerning the serious safety risks posed by consumer use of loose cells. Battery Safety, Consumer Technology Association. All great answers. Here is a short one. A 7.4 volt. 5 amp-hour battery has 37 watt-hours of energy, or 133,200 joules. Compare to a .357 Magnum's 873 joules of muzzle energy. The trick is not to let it a bunch of it out at once by overheating or crushing. I think your info is outdated. I had a coworker who was into RC airplanes. They were early adopters of LiIon technology because they are light and hold a lot of power. He related how they had two failure modes, one of which was incindiary. Planes would literally explode in a ball of fire while in flight. Eventual commercial cells have, I later read, multiple different safety features integrated into the sellable units, required by law. They are safe now, as long as you don't break or breach one, or allow it to get too hot. Heat control is part of the finished device design: you might have poor venting or improper thermal fusing and thus allow it to go critical. Some newer products are not quite so safe, in particular "bag cells" that don't have the durability to handle without being integrated in a properly designed device. So, learn how to use them safely, and learn the specific details of the parts you choose for your design. Not the answer you're looking for? Browse other questions tagged batteries lipo or ask your own question. Many-year-old laptop batteries: safe in my closet? For how long? Why are car batteries still so heavy? Why are Edison screws allowed to be used? What protection circuits do laptop batteries come with? How to gauge safety of cheap Lipo batteries? How dangerous are LiPo batteries in phones, laptops, tablets? Why was restoring a dead lipo battery possible?